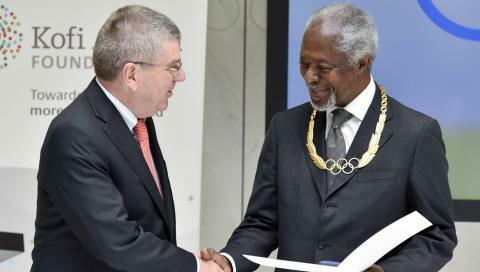 Lausanne – International Olympic Committee (IOC) President Thomas Bach presented Kofi Annan with the Olympic Order in Gold today during an official visit by the former United Nations Secretary-General to the IOC headquarters in Lausanne. Mr. Annan was awarded the Olympic Order in 2007 but due to his busy schedule was unable to attend an award ceremony until today. “The Olympic spirit is something that has been with me for a long time,” Mr Annan said during the presentation. Mr Annan was the seventh UN Secretary-General and served from 1997 to 2006 and attended many editions of the Olympic Games during this time. He was a staunch supporter of sports-related initiatives and projects, among others the proclamation of the International Year of Sport and Education in 2005 and the appointment of the first Special Adviser on Sport for Development and Peace. IOC President Thomas Bach thanked Mr Annan for his “many years of service to sport and for championing the unifying power of sport through the Kofi Annan Foundation,” which seeks to mobilise political will to overcome threats to peace, development and human rights. The original article was published by the International Olympics Committee.